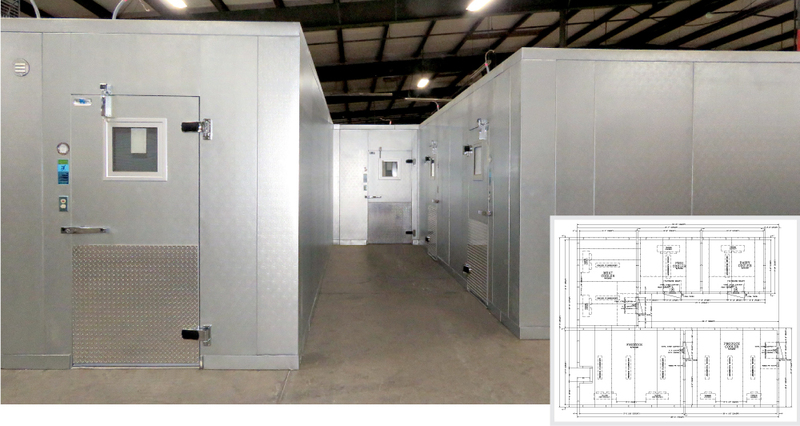 Pictured preassembled at Thermo-Kool’s factory is an actual size 33’10” x 29’8” x 8’6” high five compartmentThermo-Kool walk-in cooler/freezer combination which was recently installed at the Isla Bella Beach Resort in Marathon, Florida. The walk-in consisted of a meat cooler, fish cooler, dairy cooler, produce cooler and a freezer. Thermo-Kool’s uncompromising commitment to the highest level of quality and excellent customer service make a perfect fit for the prestigious resort. high 1/8” aluminum treadplate kickplates on the interior and exterior to protect the doors against excessive abuse and traffic. Each compartment was supplied with a remote quick connect precharged refrigeration system which was adequately sized to ensure the proper temperature is maintained. The Isla Bella website also boasts: At Isla Bella you’re pampered wherever you go, and dining is no exception. Get swept away by thoughtful service and a decadent meal in a classic Italian restaurant, seafood by the sea, or a burger on the beach. Florida Keys dining at its finest. Where every sip, every bite, and every plate arrive with flawless service. And inspiring views of the most beautiful place in the keys. Thermo-Kool Customer Account Representative,Debbi Tisdale worked on the project with Alejandro Pinero, Project Manager with Cheney Brothers, Riviera Beach, Florida and Thermo-Kool Marketing Agent,Randy Souza with Eaton Marketing & Associates, Orlando, Florida.